After John Tavares left Long Island for his hometown of Toronto to give the Maple Leafs some of the deepest depth down the middle in the entire NHL, oddsmakers were quick to put the Leafs as the odds-on favourite to win the Stanley Cup in the 2018-19 season. A month and a half has passed since Bodog released those odds. 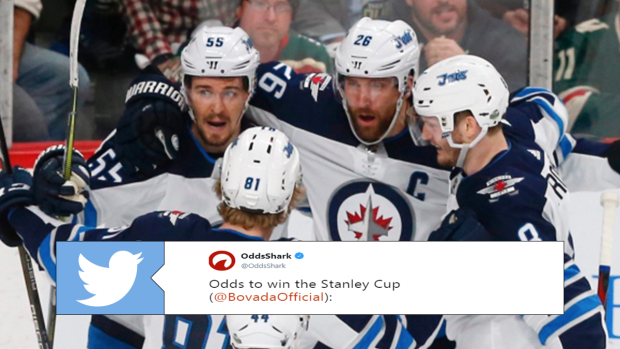 But over at Bovoda, another popular online sports gambling website, has released their latest odds after the dust settled on the NHL off-season. While the Leafs still have the lowest odds at +750, the Tampa Bay Lightning are also tied with them in what is a bit of a puzzling move considering how the Leafs defence stacks up against Tampa’s. Are the Leafs really that good, or are the bookies just lowering their line since Leafs fans will surely be wager money on their team this season? Coming in with the third lowest odds is the Winnipeg Jets at +950. The Jets didn’t add any significant free agents additions over the offseason, but Bovada clearly thinks their young core of Mark Scheifele, Patrik Laine, Connor Hellebuyck, Kyle Connor and company can continue on their upwards trajectory and win the Western Conference. The cup-winning Caps are tied with the Golden Knights and Predators at +1100. The 2016 and 2017 Stanley Cup Champion Pittsburgh Penguins and Boston Bruins come in at +1200. Bovada has faith in the Edmonton Oilers to bounce back, as they’re listed higher than the Flyers, Ducks, Stars, Blue Jackets, Flames, Wild, Devils and Avs. Here are the full odds. If you’re looking at a value pick that could make for a big potential payday, take a gander at the Flames at +3300. The club bolstered their offence by adding James Neal and Elias Lindholm in what should help them find the back of the net more. The Pens at +1200 could be tempting as well, as Sidney Crosby and Evgeni Malkin could be hungry to get back to the promise land and chase a fourth Stanley Cup. But if you're confident in a team like the Lightning or Preds, then have at 'er. And what about the Detroit Red Wings who have the highest odds at +20000? The mighty have fallen, folks. If you actually plan on throwing some money down on this type of bet, make sure you browse around all the betting websites to find the best odds for your selection. If you're unfamiliar with these sort of odds, just remember that if the odds are +750, you would make a profit of $750 if you were to bet $100. To compare and contrast, Bodog’s current odds are as follows. What teams or odds jump out to you? Let us know in the Facebook comments!